I can eat and entire batch of Muddy Buddies in one sitting, by myself. Add pecans to that mixture? Stick a fork in me, I’m done! Jordan recently discovered Bath and Body Works. I guess I should be happy about that, because it’s all soap and lotion, two things she’s been adamantly against for the past 10 years. But, in the short span of just a few weeks, she’s become obsessed with it. Move over Taylor Swift, Jordan’s got Bath and Body Works now! Really, the obsession began when we went shopping at Justice for Girls. You know that store right? A hand sanitizer costs $9? Yeah, Jordan discovered that the hard way. Her heart was broken because she only had $6, so I took her over to Bath and Body Works, where hand sanitizer is priced for normal people, not billionaires. Since then Jordan has spent hours on the Bath and Body Works website deciding what to put on her Christmas list. I think it’s safe to say that I know where I’m shopping this year. Also – yes, I said Christmas list. For the last week I’ve gotten daily emails about what she wants for Christmas, because she started it in a Google Doc – isn’t that how all lists are made these days? Get with the program, Santa. She hums Christmas tunes, walks around hugging wrapping paper, and has already started asking me what time Grandma and Papa are showing up on Christmas Eve. Lord help me people, I’m still sitting over here thinking “Let’s see, Halloween is on Saturday. I guess I should buy a pumpkin? And some candy?” Oh, to be a kid again. Speaking of Christmas, you can cross decide what to make for gift giving off your list. 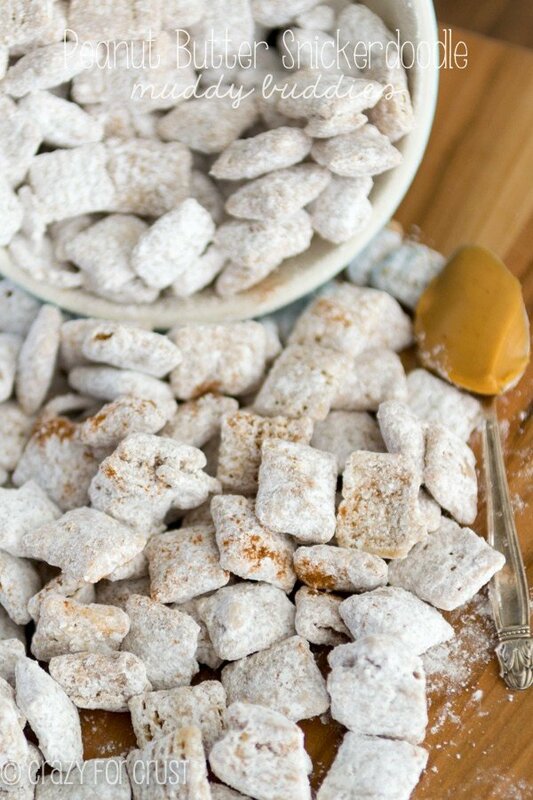 I’ve solved that problem for you: you should make Muddy Buddy Pecans. I’ve been holding out on you for a whole year, y’all. I made this recipe as part of my Christmas gifts last year and then never shared them. I was digging through old photos and came across these and thought I must share them now. Like all muddy buddy recipes, this recipe is so easy. Like, do you have 15 minutes? You can make this recipe. There’s only 5 ingredients and two of them are chocolate and peanut butter. Really, that’s all you need to make life good: chocolate and peanut butter. Am I wrong? All you need to do to make this recipe is melt some peanut butter, chocolate, and butter. 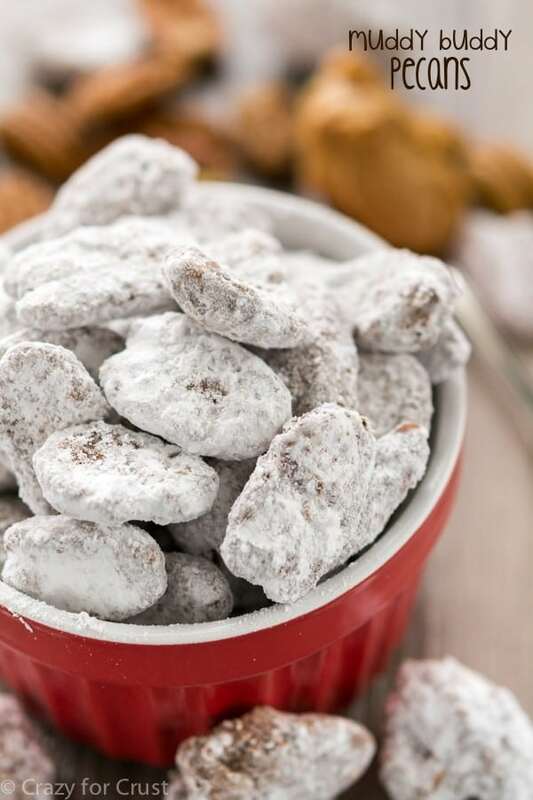 Toss it with toasted (or raw, your choice) pecans, shake it with powdered sugar, and then hide in the closet and eat them all. Because, really, that’s what you’re going to want to do. You don’t have to use pecans. Almonds, mixed nuts, peanuts, cashews…do I need to keep going? All would work. You don’t have to toast pecans, but I prefer it. You can use raw pecan halves if you want. Raw nuts bug my mouth, so I always toast them. I often get asked how I get such a good coating of powdered sugar on my muddy buddies. The secret? The patented (not really) double shake. Shake to coat, let cool, shake again, serve. Pretty muddy buddies every time! 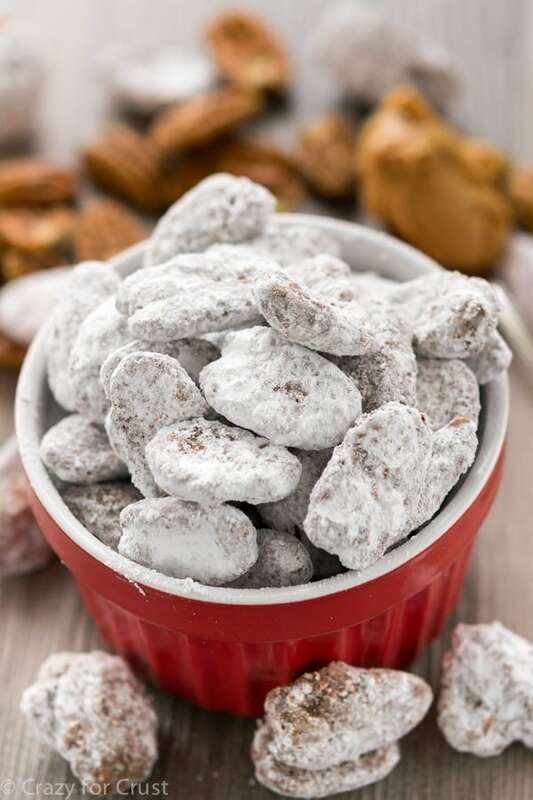 Muddy Buddy Pecans make a great gift or snack! They're perfect for parties and the holidays and come together in minutes with just a few ingredients. *I like my pecans toasted. You can skip this step if you prefer raw pecans, or to make this no-bake. * Preheat oven to 350°F. Place pecans on a baking sheet and bake for just a few minutes, stirring each minute, until the pecans are lightly toasted. Once you smell them, they’re done. Do not walk away from the oven for any reason or they’ll burn! Nuts go from raw to burned in seconds, so as soon as you smell them, remove them from the oven. Pour them into a large bowl and let them cool. Place chocolate chips, peanut butter, and butter in a medium sized bowl. Heat in the microwave on high power, in 30 second increments, stirring between each, until the chocolate is melted and smooth. Pour over pecans and toss to coat. Place 1 cup powdered sugar in a large gallon size bag. Pour pecans in the bag, seal, and shake to coat. Turn out onto a cookie sheet covered with parchment paper and let cool. If desired, shake with another cup of powdered sugar before serving. 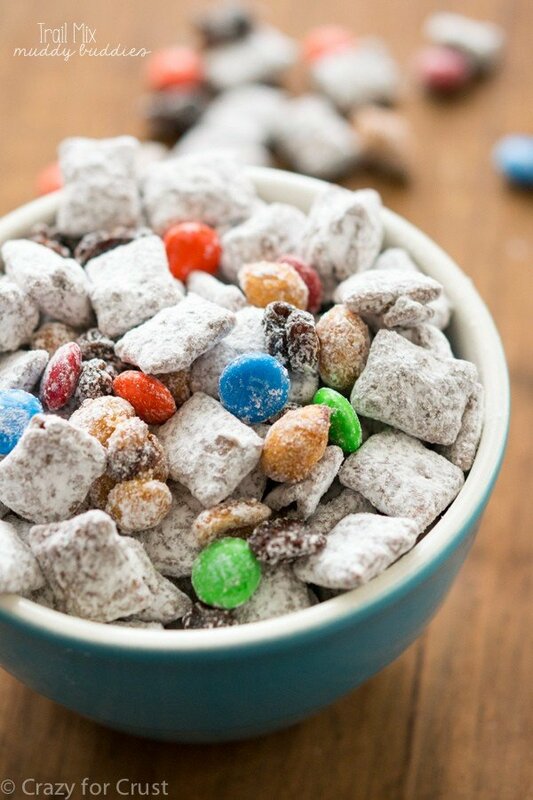 I think besides ice cream muddy buddies would be one of my all time favs! That stuff is so addicting!! Now this version I would call healthy because it’s nuts, right?!?! So I can eat more!! I can’t wait for my girls to want to use soap! Haha 🙂 What is it with kids and refusing to use soap?? RIGHT? All the time!! It’s a chore to wash oneself, I guess. I could eat my weight in muddy buddies! Why is it so good?!?!?! I know I will love this fun nut version. And as for holding out on recipes, I have a few of those from last year too. I remember shopping at Bath & Body works when I was younger…lately it’s just been Target or Walmart lotions. My daughter loves those little expensive lotions from Justice too. It’s crazy how expensive they are there! Everything is expensive there. And now they barely ever do the 40% off anymore. I’m so glad she’s almost grown out of it! 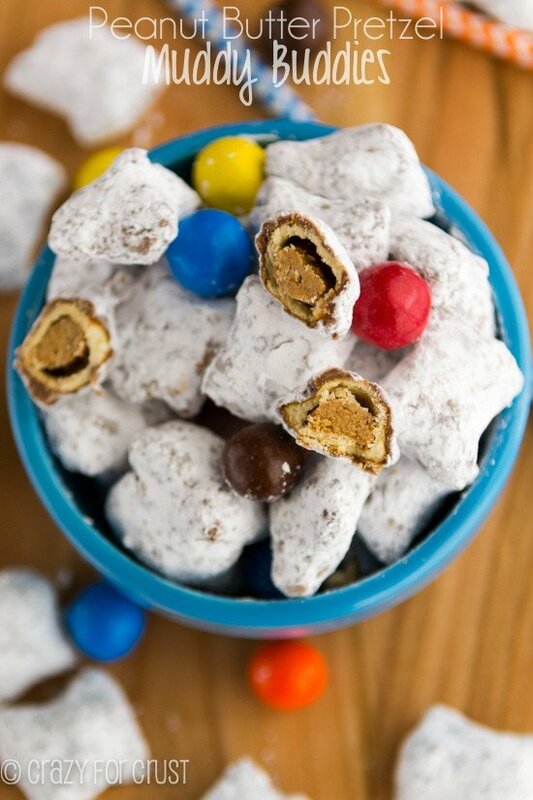 and OMG OMG OMGA this is the perfect improvement for regular muddy buddies! I loooove pecans! This is the kind of recipe that I am always afraid to make. Its a given that it is going to be amazing, therefore I won’t share and I will wonder once again why I have a weight problem. But, these are genius!! Thanks, these look great! I have a granddaughter that doesn’t care for peanut butter so I’m wondering about substituting Nutella or almond butter. Any thoughts or suggestions? I’m pretty sure either will work! Enjoy!